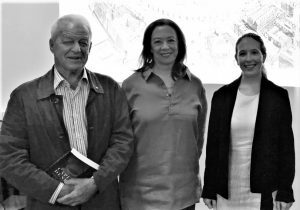 On Tuesday 26th March the AIIA NSW hosted the Sydney launch of Dr Eileen Chanin’s new book Capital Designs, Australia House and Visions of an Imperial London. In conversation with Neal Blewett AC, Dr Chanin discussed how the construction of Australia’s oldest diplomatic mission, Australia House, transformed central London. The grand, classical-style Australia House was one of the first buildings to be erected on the then vacant parcel of land between Aldwych and the Strand, the critical connecting road between the Parliament at Westminster and the City of London. The choice of location signified a newly federated Australia’s ambition to carve a dignified place for itself in the trading and financial capital of the world to attract both investment and immigrants. The project was enthusiastically supported by the British monarchy and the elite, who saw in the redevelopment the opportunity to visually project Britain’s status as a culturally sophisticated global power and leader of the Commonwealth. Notably, Australia House was the first purpose-built diplomatic building in London. Work began in 1913, and Australia House was officially opened on 3 August 1918. The completed building features wood and marble shipped from Australia and sculptures carved by an Australian artist, Harold Parker. Today, it is renowned as one of the finest remaining examples of early 20th century architecture in London, which has made it popular with film productions including Wonder Woman and the Harry Potter franchise. The history of the construction of Australia House encapsulates many of the changes that were occurring at the turn of the century. New developments in mechanisation, construction techniques and town planning are married with the financial demands of federalism and the growth of Australian national identity. As the traumatic First World War, confronting the rising power of Germany, drew to its close, Australia House – still not quite complete – was the site of a triumphal march of returning British and Empire troops. Dr Chanin’s thoroughly researched book and its striking collection of photographs celebrate the achievements of the many individuals who collaborated to turn Australia’s vision into a reality, from Prime Ministers and State Premiers to architects to King George V. With the construction of Australia House, Australia proudly announced its presence on the global stage.